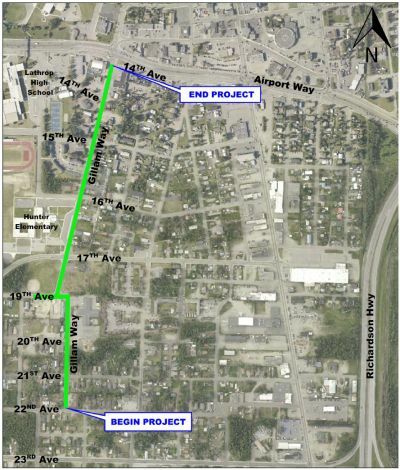 The Alaska Department of Transportation & Public Facilities (DOT&PF) is proposing to reconstruct Gillam Way in Fairbanks, AK between 22nd Avenue and Airport Way. This project was nominated for the Fairbanks Metropolitan Area Transportation System (FMATS) Transportation Improvement Program (TIP) through the combined efforts of the City of Fairbanks, FMATS, and DOT&PF. Improve safety and reduce maintenance costs on Gillam Way. More information about the proposed design can be viewed in the links provided in the side bar. The Design Study Report (DSR) describes the proposed design, and the preliminary plans show the current design advanced since the DSR. The KMZ file can be used to see the proposed improvements in Google Earth. Thank you to all who participated in our public involvement efforts to date. The project was approved by the Fairbanks North Star Borough Planning Commission in July 2018.